For a limited time, receive a FREE 32 oz. DP Carpet Extractor Pre-Treatment with your purchase of an extractor. High powered, heated carpet cleaning in a small, go-anywhere design. 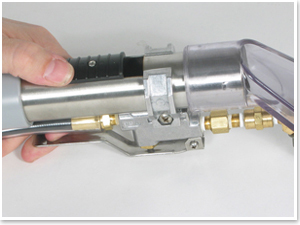 The Durrmaid Mini Hot Water Extractor is a lightweight, portable carpet cleaner for mobile detailers, hobbyists, and anyone who’s serious about clean carpet. 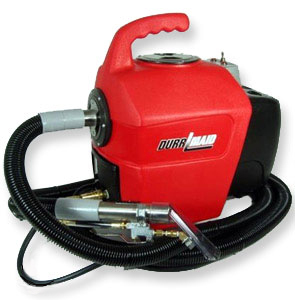 The Durrmaid Mini Hot Water Extractor offers all the features of the big commercial cleaners in a 21 lb. unit. 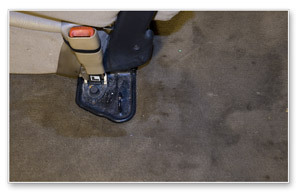 Eliminate greasy stains in your home, vehicle, RV, and boat, or wow clients with spotless interiors. The Durrmaid Mini Hot Water Extractor has a capacity of 2.1 gallons, making it incredibly light and user-friendly. This mini extractor heats the water to 200 degrees, which quickly breaks down greasy soil to release it from your vehicle’s carpet and upholstery. Old, ground-in carpet stains disappear after using the Durrmaid Mini Hot Water Extractor. The Durrmaid Mini Hot Water Extractor has an easy-access control panel just behind the handle, including a water level indicator light and a heater light. Once the water tank is filled, it takes about 15 minutes to heat. A 200 micron, nylon filter bag in the recovery tank enables the Durrmaid to pick up heavy debris, like dirt, sand and even hair. The bag holds up to 5 lbs. of debris! This feature enables you to dump solid debris into the trash and pour out the liquid waste water separately. Quickly empty the filter bag with a quick turn of the lid. The contents empty through an opening in the bottom of the bag, as shown to the right. 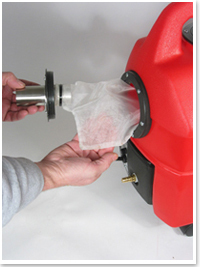 The Durrmaid Mini Hot Water Extractor includes a see-through Lexan Carpet/Upholstery Tool. This detailing tool has stainless steel glides which travel easily over carpet with no friction. Because they’re stainless steel, they will not warp due to hot water temperatures. 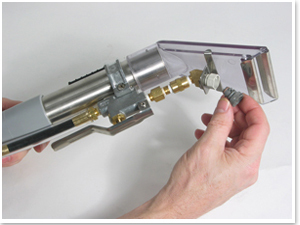 Two quick-change spray tips allow you to cut the water flow to reduce drying time. The vacuum’s suction can be reduced with a thumb control, for delicate areas, like the headliner. Optional tips restrict water flow to prevent over-saturation of fabric or carpet. For crevices and tight spaces, get the Durrmaid Stainless Steel Crevice Tool (sold separately). This 18 inch long attachment narrows to less than a 1/2 inch, giving you unparalleled access between seats, under seats, between cushions, and anywhere else! The stainless steel barrel and brass spray tip are built for durability. The ability to remove tough interior stains is what sets successful detailers apart from everyone else. 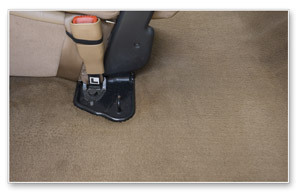 Clean, spot-free carpet and seats will keep clients coming back. The Durrmaid Mini Hot Water Extractor is the perfect portable carpet shampooer for mobile detailers. This compact carpet extractor packs all the features of a larger unit into a lightweight, convenient cleaning machine. The vacuum reducer limits the suction on delicate surfaces, like the headliner. Solution Hose: 12 ft. x 3/16"
Vacuum Hose: Commercial Grade, 12 ft. x 1¼"
This item is oversized. A shipping rate of $40 applies. The Durrmaid S2H-1500 WF has a 1 year limited warranty on the mechanical and electrical components. The housing is warrantied for 5 years from date of purchase. This Durrmaid Carpet Extractor ships direct from the manufacturer via Ground Service Only. Expedited and international shipping are not available. *Discounts are not applicable on this item.